Only Googlebot Reads This Blog: The Foundation Series: What's Your Story? Note: This originally ran on toyphotographers.com on February 12 2018. It is the first post of a monthly series about lessons I've learned along my journey as an artist. It is reposted here for posterity. The idea of a story in a photograph is, to be honest, something I struggle with a lot. When I think story, I think the “Star Wars” saga, or “Lord Of The Rings”, or even “Green Eggs And Ham”. It’s quite obvious that it’s not possible to put a whole literary story or feature length movie into a single photograph. Heck even something short like “Green Eggs And Ham” would be hard to fit into a single photograph, and that is a story comprised of only 50 different words. So clearly we need to narrow things down a bit when we talk about story. My definition of a story in a photograph is “a word, phrase, or sentence that describes the intent of the photograph.”. This can be as short as an emotion, like “melancholy”, or “two ninjas fighting.”, or “Luke Skywalker faces down a menacing AT-AT Walker approaching in a snowy storm”. As you can see, the story can be as simple or complex as required However once you have that you can use that story to help define how you want to create your shot. Let me give a couple of examples from my back catalog of images. Walking across a bleak dystopian wasteland. I found this location at Nelson Ghost Town in Nevada with this cool broken down plane. When I saw the location, I came up with the story in my head, then started framing the shot. The decisions I made were the following: Walking implies distance, so I put the figure in the lower right corner so he had room to move in the frame. Wasteland brings to mind hardship and decay, so I placed the figure between the rocks to give a sense of struggle against the elements. I also blew some dust across the scene to give a sense of energy, danger and loneliness as well. The plane is at top of frame so the is walking towards a decaying artifact. Finally my story didn’t really care who was walking in the dystopian wasteland, so I shot him from behind. This both anonymizes the figure (i.e. we don’t really care who he is), and also gives the sense that he is walking in solitude (we can’t see his face, so we don’t develop an emotional connection to him), which adds to the dangerous solitude one associates with a wasteland. Boba Fett charging menacingly into action. This shot is all about Boba Fett. He is a well known figure in the Star Wars universe, known for shooting first and asking questions later. So I placed him center frame, facing the camera, so we are forced to pay close attention to him. To further the sense of immediacy and danger, I positioned him so he is aiming his gun straight at the camera. Not only that but he is running towards you at the same time, getting closer for a better shot. He’s not threatening just anyone… he’s threatening you. Pay attention! You are about to have a bad day. My story didn’t include a setting, so I made it a generic background, with some light to bring the character out from the background, further indicating he’s coming your way. 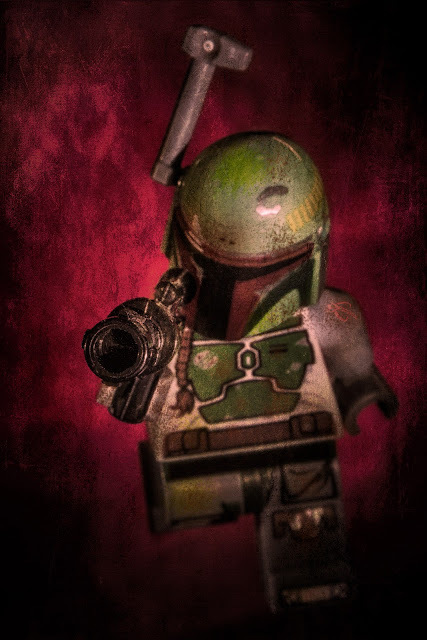 Since Boba is a rough and tumble man of action, I added some textures to him to give that sense that he’s seen a lot of action, and is capable of making good on his threat he is making. Vastly different stories, vastly different end results, but in both cases the decisions made in each image serves the story. If I had shot Boba from behind, the idea of him being an immediate and personal threat would be lost. 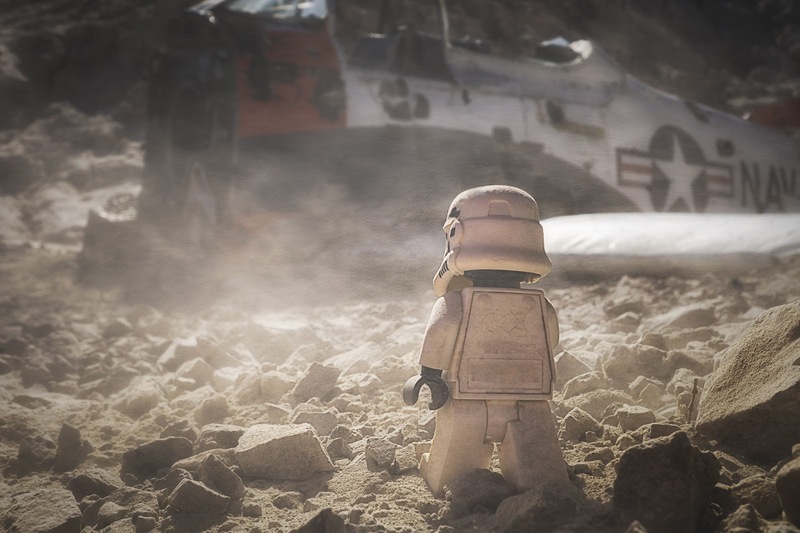 If I had put the Stormtrooper front and center facing the viewer, the impact of a lonely figure walking across a wasteland would be lessened.